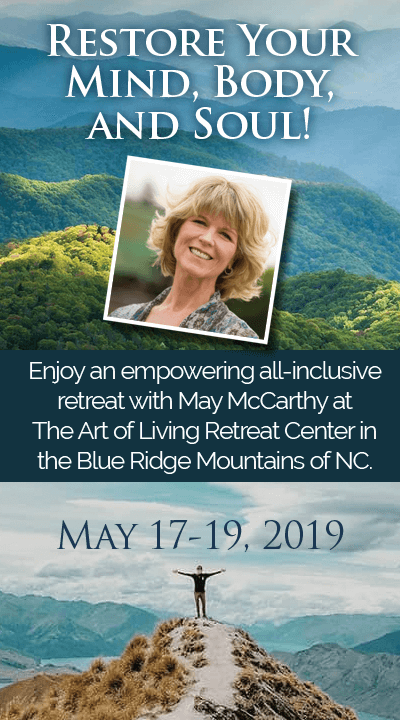 Weekend Retreat with May McCarthy, May 17 - 19, 2019. UNLEASH Your Power and learn to live your purpose, eliminate false beliefs, and achieve more of your desires sooner during this wonderful weekend retreat at the beautiful Art of Living Retreat Center in Boone, NC. To learn more, please visit this link. Are you looking for deeper study options? Visit our web-store for up to 50% off most items. I heard a great speaker recently who shared how in the midst of a Storm as in an unexpected terrible situation, it can feel like we’re not going to make it. We can feel ready to give up and wonder “where is God in all of this?” The speaker reminded the audience that only we have the power to choose how to view and react to any situation. As part of that process, we can choose to be a victim and give up or choose to be a victor and survive. It’s a matter of attitude. Viktor Frankl was a holocaust survivor and the author of a number of books including “Man’s Search for Meaning”. An incredible storm of injustice and terror was thrust upon Frankl and millions of other Jewish people. None of us, unless you’d actually been there, could possibly imagine what Viktor Frankl and others experienced in Nazi concentration camps. This was a terrible storm filled with horror, pain and suffering. Frankl tells us “Everything can be taken from a man but one thing: the last of the human freedoms—to choose one’s attitude in any given set of circumstances, to choose one’s own way.” I agree – attitude is vital for survival. Attitude as words, thoughts and emotions, were keys for Frankl in enduring the horrendous situation he was put in. What about other Storms that we face today? Writer David Pelzer says, “You can be a victim of cancer, or a survivor of cancer. It's a mindset.” I’m a survivor of cancer – I choose to maintain that attitude. Several of my friends are too. All of us were scared upon hearing our diagnosis. We also knew that succumbing to the fearful thoughts would only make matters worse. So, instead I went to church with my mother twice a day and thanked God repeatedly for my perfect healing. My friends surrounded themselves with “champions” who agreed to only speak about my friends’ healthy, whole and complete bodies. These tactics helped to strengthen our belief in survival. You can do this too. You are a survivor in the Storms of your experience, not a victim. How about Storms in relationships? The pain of sudden and unexpected loss of a loved one can be excruciatingly painful. And, the ending of a loving relationship can hurt so bad that you can feel physically ill. Most of us will experience these kinds of losses at some point in our lifetimes. But, what can we do to come through the storm and survive? Author Anne Lamott points to attitude once again; “You will lose someone you can’t live without, and your heart will be badly broken, and the bad news is that you never completely get over the loss of your beloved. But this is also the good news. They live forever in your broken heart that doesn’t seal back up. And you come through. It’s like having a broken leg that never heals perfectly—that still hurts when the weather gets cold, but you learn to dance with the limp.” We learn to dance with the limp. We remember our loved ones and share our love with others. We focus on surviving and don’t give up. In every situation that comes your way in life, you are always at choice in how to respond and how to survive victoriously. No one can take that away from you. A friend of mine would tell me that the choice is where your power lies. I agree. You are the only person with the power to control your attitude with the words, thoughts and emotions you express. Use these tools for outcomes that you desire. Don’t give up or be a victim and don’t blame others. Shift your attitude and survive victoriously. You may be pleasantly surprised as your personal power and confidence grows, and your good life experiences increase as a result of shifting your attitude.